This family-friendly (don't worry, it's not spicy!) classic Cuban dish is extra easy and a tasty way to grow your dinner menu, even on your most hectic days. It's all included - no shopping, no chopping, no stress, no mess. The traditional Cuban marinade and sauce is made with real citrus with garlic and oregano, surrounding melt-in-your-mouth Omaha Steaks pork and black beans. It's a global favorite that your family will love, even if its the first time you've tried it. Just put the ready-for-you ingredients in your slow cooker before you leave for the day... when you get home, just quickly steam the pre-cooked rice in minutes and serve in big bowls to your excited gang. Feeds a family of four to eight. Instructions based on 6-quart slow cooker. Appliances vary; adjust cook time accordingly. Do not thaw. Keep frozen until ready to cook. Remove contents from box. Carefully open bag with vegetables and remove rice and sauce pouches. Return vegetables and rice to freezer. Place pork and sauce pouches under cold water to loosen film. Open pork pouches and place pork in slow cooker. Wash hands thoroughly after handling raw pork. Open sauce pouches and add sauce to slow cooker. Cover and cook on LOW for 8 hours or HIGH for 6 hours. Without stirring, add vegetables to slow cooker for the last hour of cook time. Microwave rice pouch on HIGH for 3 minutes. Carefully open rice pouch. Stir contents of slow cooker and serve over rice. Instructions based on 4-quart slow cooker. Appliances vary; adjust cook time accordingly. Do not thaw. Keep frozen until ready to cook. Remove contents from box. Carefully open bag with vegetables and remove rice and sauce pouches. Return vegetables and rice to freezer. Place pork and sauce pouches under cold water to loosen film. Open pork pouches and place pork in slow cooker. Wash hands thoroughly after handling raw pork. Open sauce pouches and add sauce to slow cooker. Cover and cook on LOW for 10 hours or HIGH for 6 hours. Without stirring, add vegetables to slow cooker for the last hour of cook time. Microwave rice pouch on HIGH for 3 minutes. Carefully open rice pouch. Stir contents of slow cooker and serve over rice. 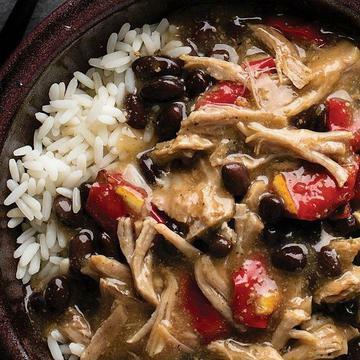 Ingredients: Pork, Cooked Long Grain White Rice, Water, Cooked Black Beans, Red Peppers, Onions, Chicken Broth, Spices, Garlic Puree, Corn Starch, Orange Juice Concentrate, Lime Juice Concentrate, Orange Zest (Orange Peel, Water, Citric Acid), Canola Oil, Sea Salt, Chipotle Morita Powder (Dried Chipotle Chiles).